LeverettNet is a Fiber-optic-To-The-Home (FTTH) broadband network owned by the Town of Leverett, Massachusetts. LeverettNet is operated under the telecom authority of the Leverett Municipal Light Plant (LMLP), which contracts with third parties for Network Operator, Internet Services Provider (ISP), and maintenance functions. LeverettNet provides symmetrical (equal upload and download) 1-Gigabit-per-second (1Gbps) Active Ethernet (dedicated fiber links) connectivity between each subscriber location and the Internet Point of Presence. LeverettNet connects from the Point of Presence to the Internet Service Provider (ISP) at 2-Gigabits-per-second (2Gbps), via the Massachusetts Broadband Institute “middle mile” network, a project of the Massachusetts Technology Collaborative. Subscribers pay a monthly ISP fee, plus a LMLP charge for Network Operator and maintenance costs. Current monthly ISP charges are: Stand-alone Internet, $23.40; Stand-alone, full-featured telephone, $23.40; Combined package, $38.40. The current LMLP monthly charge is $50.49, which is added to the ISP cost. See ISP page for details. “The Leverett Municipal Broadband Model: An Overview of Institutional, Contractual and Financial Arrangements.” April 2017. This analysis of LeverettNet is the product of a study by DHInfrastructure, LLC, a global economic consulting firm specializing in regulated network infrastructure for governments and industries. “LeverettNet Launches Fiber-to-the-Home Service.” November/December 2015. A review of LeverettNet published by Broadband Communities Magazine. “Community-Based Broadband Solutions: The Benefits of Competition and Choice for Community Development and Highspeed Internet Access.” January 2015. LeverettNet was featured in the White House Report, Executive Office of the President. “Bringing Municipal High-Speed Internet Access to Leverett, Massachusetts.” December 2013. A LeverettNet case study published by the Harvard Law School Berkman Center for Internet and Society. Town of Leverett Seal. Click to view larger. Planning for LeverettNet began as early as 2008, when Massachusetts created the Massachusetts Broadband Institute (MBI), charged with bringing broadband service to all residents and businesses in Massachusetts. The legislation provided MBI with an initial $40 million in state bond funds, earmarking at least $25 million for developing a broadband network in Western Massachusetts, where Leverett is located. Leverett signed on as a Participating Town in the MassBroadband 123 project early on and became a strong supporter of MBI in the process. Town residents attended information meetings, wrote letters of support, and assisted MBI’s efforts to obtain federal funding. In 2010, the federal government awarded MBI an additional $45.4 million in federal funding under the American Reinvestment and Recovery Act of 2009, to support the expansion of broadband infrastructure. The funds were applied to an MBI program called “MassBroadband 123” to build a “middle mile” for network connectivity in designated communities in western and central Massachusetts. A “middle mile” is the segment of an Internet network that connects a core network to a local “last mile” network. construction of network connection buildings, in conjunction with MBI’s provision for two middle-mile nodes in Leverett. Our inquiry into community needs for broadband coincided in part with a separate investigation of telephone service quality by the Massachusetts Department of Telecommunications and Cable (DTC). On petition by the Select Board, Leverett was granted permission to intervene as a party to the DTC proceedings; we participated fully in the process, up to and including settlement discussions that resulted in an improvement of telephone service throughout town. During the DTC investigation we learned that the telephone infrastructure, even after improvement to sustain mandated voice quality service, would not be sufficient to support DSL service in most of the Town. We also learned that the telephone company had no intentions of upgrading the infrastructure in Town to support fiber optic service. This information was conveyed to residents and bolstered their insistence that the Town take whatever steps possible to provide broadband access via other means. Our next step was to assess business plans, engineering data, and methods for acquisition of infrastructure utilized in municipal broadband solutions from various sources across the country—including the Fiber-to-the-Home Council, a 2009 CSMG study for Corning, and a Charter Communications report on network implementation. This field research was coupled with further information from the Massachusetts Broadband Institute (MBI) and propelled us to the conviction that the Town must and could take the lead in developing broadband access. The March 2011 MBI Broadband Technology Summit and the April 2011 forum, “Broadband and Western Massachusetts Communities,” sponsored by the UMass/Amherst Science, Technology & Society Initiative, confirmed this view. As we have been working toward a municipal, town-wide solution, individuals and households have grappled on their own with the need for broadband through satellite access. The availability of satellite access through two providers is best seen as a contingency option; it far surpasses dial-up and offers download speeds comparable to DSL, but installation and monthly fees are expensive, and download caps may increase monthly costs dramatically for high bandwidth users (e.g., streaming video). Moreover, latency is much greater in satellite connections, and this, coupled with contention rates, interferes with and can render impossible certain types of applications, including two-way video connections and virtual private networks, as well as real-time gaming. In addition, satellite service is susceptible to weather; heavy rain or snow, either locally or at the provider’s ground node, interferes with and may completely block access. The conditions described here are the subject of increasingly concerned discussions among Leverett residents. Individuals and groups, formally and informally, are vocal about the significance of broadband access for their daily life, their livelihood, their children’s education, and the viability of the community. 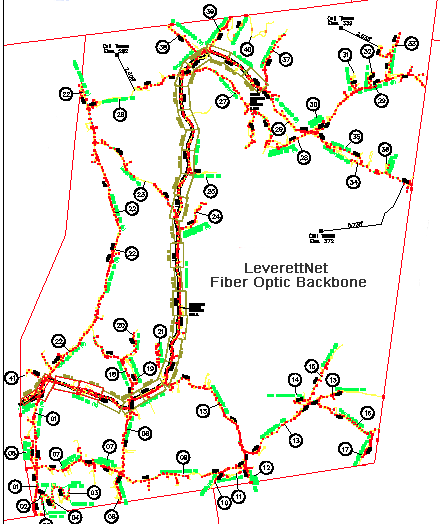 Taken together, our analyses of community needs and efforts to attain broadband access, coupled with information about the experiences of other municipalities in similar situations, provide the basis for a conclusion that Leverett needs and has the capacity to develop a municipal broadband network of fiber-to-the curb. Our development progress to date has established potential partnerships with local and regional providers and has resulted in a strong community organization to sustain this effort. In June of 2011, MBI awarded $40,000 to Leverett for initial network design. The Select Board began a Request for Proposals (RFP) process to select a design contractor. The members of the Broadband Committee brought an array of experience and knowledge, including a software engineer, a database engineer, a network engineer, a capital projects manager, and a former research and development executive. The chair was an attorney and member of the Select Board. One of the members was the Town Executive Administrator. In December 2011, the Town contracted with G4S to draft design schematics and specifications for a “last mile” broadband network. Initial Network Backbone Design by G4S. Click to see larger image. Although the original concept was to build a “fiber-to-the-curb” (FTTC) network, Broadband Committee consultation with G4S engineers and planners led to a decision to build a “fiber-to-the-home” (FTTH) network. An FTTC network would put a fiber-optic distribution infrastructure in place, but leave residents and businesses to make the final “last 100 feet” connection to produce a working network. In contrast, an FTTH network builds the network to each location, resulting in a network ready to operate from the start. An FTTH build leaves only simple internal wiring within each building to supply a finished network. The FTTH model allows for all engineering, design, and construction to be done as a package, resulting in efficiencies of build and design and leading to higher subscriber percentages or “take-rates” from the outset. On April 28, 2012, the Leverett Annual Town Meeting, approved a general obligation municipal bond issue, with 90% voting in favor of the measure, to finance the construction of a Town-wide FTTH network to provide consistent, reliable high-speed broadband. The network was designed to provide “last mile” connections to the Internet via the MBI123 ‘middle-mile’ network owned by MBI and operated by Axia NGNetworks. On September 4, 2012, at the request of MBI, the Broadband Committee issued a Request for Information (RFI) to help inform the planning process. Responses to the RFI would provide information useful not only to Leverett, but to other Massachusetts towns exploring municipal networks. The Broadband Committee and Select Board developed a close working relationship with MBI. Leverett research, plans, and actions became an asset to MBI as a good source of local information and as an example that other towns could follow. Network construction started in June 2013 with the award of a build contract to Millennium Communications Group. The build included installation of approximately 39 miles of aerial fiber optic distribution cable along all roads in town and approximately 800 fiber optic “drops” to Optical Network Terminals (ONTs) on homes, churches, government offices, and businesses. The network design included fiber allocations for unbuilt buildable parcels in addition to existing structures and locations. The network architecture of LeverettNet is Active Ethernet (AE), supporting symmetrical gigabit/second speeds and advanced network services to all subscribers over dedicated fibers connecting an ONT at each location with the middle-mile node. AE is also known as “home run” architecture. Construction was complete in August 2015, and the Leverett Municipal Light Plant (LMLP), a municipal entity of the Town of Leverett, took custody of the network as a municipal telecommunications infrastructure under Massachusetts General Laws. LeverettNet Network Design. Click to view larger.